Veterans who have returned from active military duty often need to obtain employment and reintegrate into civilian life. Despite all the veteran benefits offered by the government and various DVBE organizations, many employers are hesitant to add veterans to their workforce. Skills mismatch: Military training provides individuals with excellent skills to make them good leaders. All too often, however, employers cannot get things done with leadership skills alone – they look for particular skills or experience needed for a job, which veterans simply may not have. Skills translation: Sometimes veterans have the skills that potential employers are looking for, but may not be able to project them correctly. Consider the lifesaving skills gained during combat experience, which could translate into what a civilian paramedic or EMT does. “Skill translation” is a problem for a lot of veterans who are unable to explain how their military skills translate to non-military jobs. Education: Most veterans do not have advanced degrees or qualifications, so veterans jobs tend to be restricted to unskilled or lower positions. Since they have to compete in the difficult economy, with civilians who also face trouble finding employment (despite higher education and degrees), they tend to get passed over by employers. New skills: Veterans are used to learning skills from a predefined program that often puts an emphasis on physical work. For civilian jobs, they may find themselves unable to acquire new job-related skills. This creates a problem for employers who hire veterans and want people who are flexible enough to keep up with changing business needs. PTSD (Post-Traumatic Stress Disorder): PTSD is a serious issue among many veterans, causing nightmares, flashbacks and even sleeping disorders. However, this veteran disability goes away with time and does not affect every veteran. Employers, though, are usually quick to assume that every veteran has a history of PTSD. Overcoming this negative stereotype is perhaps the biggest problem that veterans face in civilian jobs. Discipline: Discipline is an important part of military life, and veterans are among the most disciplined individuals in the world. In a military scenario, this is good, but in everyday civilian jobs, too much discipline could be dangerous. A non-military manager may be lenient about employees coming late to work, taking a sick day and so on, while a veteran may not show the same leniency, leading to morale problems in the office. Rigidity: Another aspect of military life is rigidity: Veterans are taught to obey orders without question. In a civilian job scenario, not everything is cut and dry. Most non-military jobs require creativity, where veterans might be lacking. Employees are expected to think outside of the box, which won’t happen with many veterans. This makes employers avoid veterans for creativity-oriented jobs. Culture shock: There is a stark contrast between military and corporate culture. Corporate culture is defined by a (comparatively) lax attitude, casual wear, and a world where rules can be bent or broken if necessary. The military is not lax at all, and protocol needs to be followed, so veterans often find themselves unable to adapt to corporate culture. Co-worker interactions: Veterans, due to their nature of past employment, may find it difficult to work with their non-veteran co-workers. Also, some civilians find it difficult to work with veterans, because of perceived rigidity. Many employers worry that the work atmosphere might suffer by adding veterans to the mix. Future deployments: The last issue for employers is the chance of recall and future redeployment. Veterans could be asked to return to active duty at short notice and may not have the option to decline. Employers think of their employees as assets that give returns over a period of time, which they may risk losing when they hire veterans. Staffing and consulting companies like HicksPro understand the challenges that veterans face while looking for civilian employment. 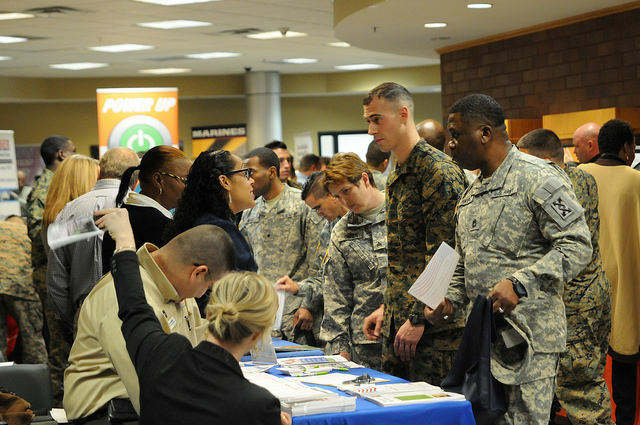 They help veterans transition into civilian life, connect with employers interested in military veteran hiring, build their skill set for non-military occupations and use online tools like social media to boost their careers, so they can enjoy financial independence and success even after retiring from active duty. Ava Collins of Hicks Group, a staffing and consulting firm with experience connecting businesses to qualified veterans, wrote this article for TriplePundit. Collins says that working with an agency that helps put veterans to work is the easiest way to go about hiring veterans as well as gaining more in-depth information about how it could vastly improve your business.